Why the CERTA Learning Center? We at the CERTA Learning Center believe that learning happens while creating. Our summer STEM Camp provides an opportunity to put discovery in the hands of your child. Combining the four disciplines of STEM: Science, Technology, Engineering, and Math, campers will learn about the mechanisms of the physical universe while having fun. Our goal is to create the next generation of life-long learners as they explore natural phenomenon to spark interest in STEM-focused careers such as engineering, medicine, and computer science. Each session will provide an opportunity to learn, design, build, and discover in a truly integrated, carefully designed program. We encourage learners of all science backgrounds to discover the world around them while utilizing fundamental learning skills to prepare for problem solving in the future. TO REGISTER, PLEASE COMPLETE THE FORM BELOW. YOU WILL RECEIVE AN EMAIL SHORTLY AFTER SUBMITTING. PLEASE CHECK YOUR “SPAM” FOLDER IF YOU DO NOT SEE THE EMAIL IMMEDIATELY. 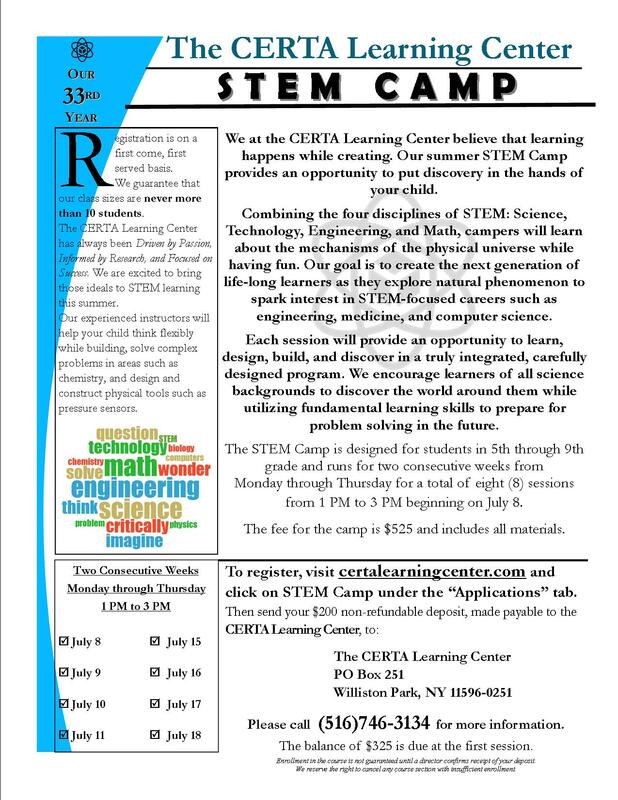 Please complete the following form for the STEM Camp offered at The CERTA Learning Center. What grade will your child be entering in Fall 2019? Please list the name(s) of other family members who have attended The CERTA Learning Center.